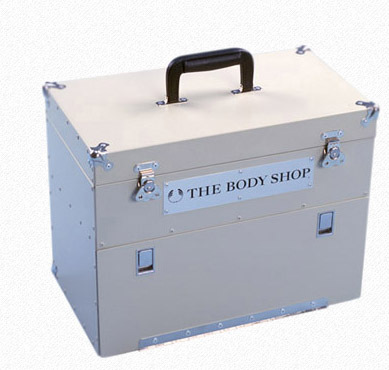 In 2001, a cosmetic company's designers approached Impact Cases regarding the design and manufacture of a specialized professional cosmetic case. The customer’s case design had to be unique from any other cosmetic case available anywhere in the world. The cosmetic case needed be used as a display for their cosmetic product line in stores worldwide. It was imperative that the cosmetic case aesthetically match and geometrically fit with the cosmetic products display within the stores. 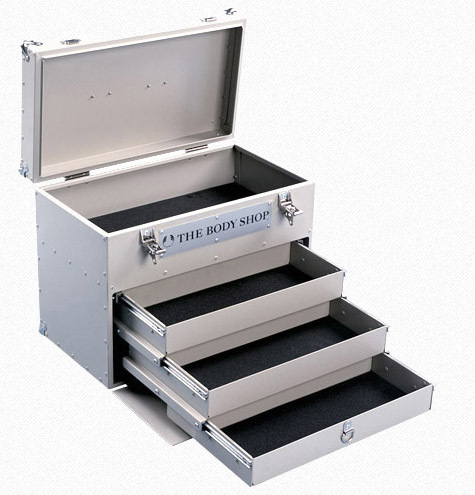 The case needed to be high strength and functional for use by their professional makeup artists. An accelerated production timetable of approx. 2000 cases to be designed, manufactured and delivered within 3 months. Impact’s design professionals sat down with the customer’s executives and reviewed the scope of the cosmetic case application (how it fit into the customer’s scheme of things). Further, the number and geometry of all items destined to be within the case had to be examined. Impact designers developed a design strategy and submitted initial drawings and solid models to the customer’s designers for review and input. The cases were manufactured using CNC technology to allow high production rates and ensure repeatable geometry. The cases were packaged in individual, heavy wall boxes to allow the customer to ship the cases to stores worldwide. The final design was a riveted aluminum case having a front “drop down” panel with three cascading drawers, and a large upper cavity with hinged lid. With the lid open and the drawers extended, all the customer’s cosmetic products could readily be displayed in an aesthetically organized manner.